Twitter is about publishing. Twitter is about writing. And it’s about having fun, making connections and sharing things. I’ve made a focused effort to use Twitter a little more strategically since May as it tied in with some other business aims. And it’s started to work. Here are some ways I use Twitter and some ways I don’t! 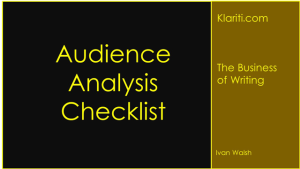 When discussing Audience Analysis, David McMurray points out that, “for most technical writers, this is the most important consideration in planning, writing, and reviewing a document. You “adapt” your writing to meet the needs, interests, and background of the readers who will be reading your writing.